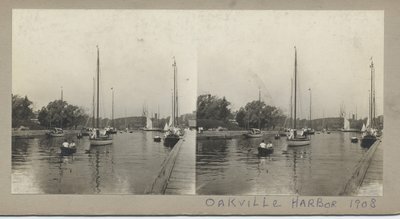 Unpublished stereoview of sailing yachts in Oakville harbour in 1908. The wooden quay can be seen along the right side of the image. In the background, the bridge carrying Lakeshore Road crosses Sixteen Mile Creek. In the middle foreground, a small yawl is being rowed towards the camera, with a sloop in tow.